The pope was greeted warmly Friday in the Peruvian city of Puerto Maldonado by thousands of enthusiastic supporters who lined the streets before his meeting with the country’s indigenous people. The pope met in the city’s coliseum with several thousand indigenous people representing more than 20 indigenous groups, who had hoped he would deliver a strong message urging the government to recognize their land rights and clean up rivers that have been contaminated by illegal mining. 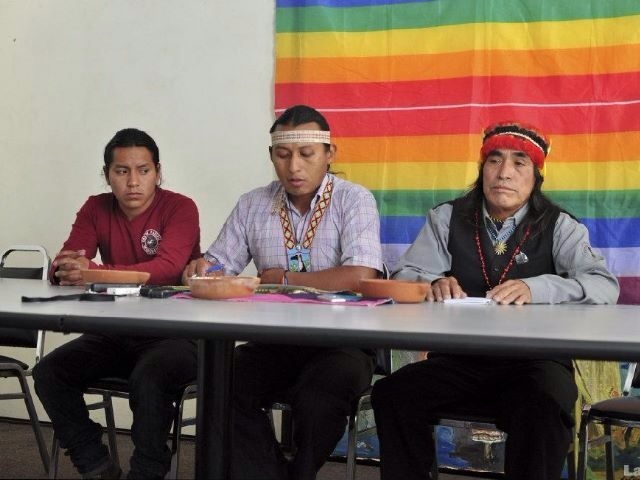 Yesterday, Indigenous leaders called for “stopping mineral extraction in southern Amazonia from moving forward and the immediate departure of the company Ecuacorrientes” following the death of Shuar leader Joseph Tendetza, who has been assassinated, Severino Sharupi, leader of territories of CONAIE (Confederation of Indigenous Nationalities of Ecuador) stated yesterday. The previous Wednesday [3 December 2014] the body of Tendetza was found in the Pastaza River, after he had been missing for more than five days. He was going to attend the People’s Summit in Lima, to explain the status of the mining and its impacts. For Sharupi “the presence of the company has brought with it much conflict,” including evictions and threats. “It is creating conflict whereas (Tundayme, Pastaza) this was a quiet and peaceful area”. The Shuar leader said Domingo Ankuash remarked that after initial refusal to perform an autopsy on the body, the procedure was yesterday. Two autopsies were done, he said. “In the first, the doctor reported that he died of asphyxiation. The second verified that it was a violent death”. The Indigenous assert that it was a murder due to Tendetza’s stand against the mining. According to Ankuash, the body, which was found on the banks of the river, was tied by the arms and waist, and had wound marks. Meanwhile, the Minister of the Interior, José Serrano, asked yesterday for an oversight [group] to be convened to investigate the murder. On the 28th of November Tendetza had to attend a meeting of the Shuar leadership, to which he never arrived. Original Spanish here: http://www.noalamina.org/latinoamerica/ecuador/item/13770-indigenas-shuar-piden-la-suspension-de-la-extraccion-minera English based on Google Translate but checked against Spanish original and modified. Accuracy is not guaranteed but gets the point across – they don’t want mining in their Amazon homeland! IT WAS REPORTED BY THE MINISTER OF THE INTERIOR THAT TENDETZA WAS STRANGLED. Tendetza was an indigenous leader-landowner who reportedly refused to be expropriated by a Chinese government owned mining company (Ecuacorrientes) and was found murdered shortly before he was to speak during the Climate Conference. Nonetheless, one must bear in mind that they are not the only mining company in the area. The big gold property is supposed to be Fruta del Norte, which the Chair of Lundin Mining, Swedish-Canadian Lukas Lundin, reportedly just bought in October from Kinross under the name of Fortress Minerals. It has been further reported that in mid-December they intend to change the name to Lundin Gold and make it their flagship mine for gold. The wikipedia article on Lukas Lundin was deleted. But, it seems that the Lundin family controls Lundin Mining, probably largely through holding companies. They also are involved in uranium mining (and petroleum). http://en.wikipedia.org/wiki/Lundin_Mining The founding father, Adolf, died of leukemia. http://en.wikipedia.org/wiki/Adolf_Lundin Too much uranium dust? They appear rather notorious. See for instance: http://www.swedwatch.org/sites/default/files/swedwatch_-_risky_business.pdf A good police investigator wouldn’t just look at China! The Shuar are in trouble! They have around 62,000 ha (153, 205 acres) of mining concessions in Ecuador including the Mirador, Mirador Norte, Panantza and San Carlos copper and gold concessions, conceded by the government but not the people. They are not the only mining company in the area. 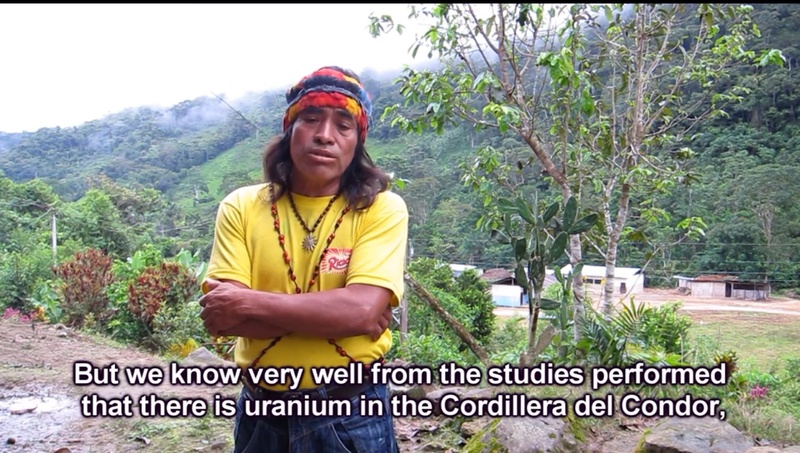 Also, according to Domingo Ankuash, while they speak of copper and gold, there is known to be uranium in the region. The second best thing is to buy used, but better to let someone else buy used so they don’t buy new! Close down nuclear reactors so there is no need for uranium mining. Copper has important uses http://www.australianminesatlas.gov.au/education/fact_sheets/copper.html but is being replaced by conductive plastics and can be recycled. These mines are low grade at 0.5 or 0.6% copper, 0.1 to 0.7 grams per tonne (1,000 g) gold. Over 99% is waste rock. Uranium is probably a low grade by-product of this low grade mine. Nuclear power is destroying the land and the oceans from mining to constantly leaking radionuclides during energy production to accidents to waste which will be allowed to legally leak for perpetuity. We need the Amazon for climate control and for oxygen (along with the ocean). In a real crisis your gold will do you no good. And, you can’t take it with you when you die. Besides greed, the elephant in the room is overpopulation. Support family planning. Contrary to what they want people to believe, family planning is just that – planning. If there is planning there won’t be abortions. The reason the economy must grow and new jobs be created is only because the population is growing. Population growth is an environmentally destructive pyramid scheme, that must stop at some point. Better now than later. Two children is replacement.